WabiSabi is a nonprofit organization in Moab with several community programs. WabiSabi runs a thrift store, serves free or by-donation meals, awards “Make a Difference” grants to aspiring community projects, donates biannually to its Nonprofit Partners, holds events through its Nonprofit Network, and gives to those in need through community donations to organizations and vouchers available to individuals. WabiSabi receives, revalues, and redistributes needed resources to strengthen the Moab community. 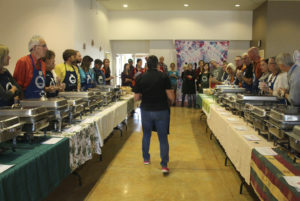 Their hope is that one day, everyone in Moab will use their resources wisely and share their excess with those in need. A variety of volunteer jobs are available at the thrift store, and the community Thanksgiving dinner provides a fun one-time opportunity for those wishing to get involved. Throughout the year, WabiSabi also has special creative and handyman projects for willing volunteers. 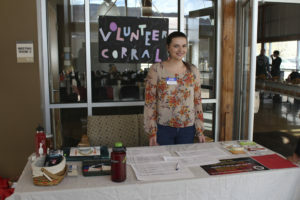 To get involved, fill out the online volunteer application at www.wabisabimoab.org/programs-participate/participate/. You can also visit the store, or contact the Volunteer Coordinator at volunteer@wabisabimoab.org or 435-259-2553.